There was a time when a friend of mine worked with me and he had previously worked with Louis Vuitton (he does now again). During the time we worked together, he educated me on how to properly carry or wear certain style handbag and that of course they had to be called handbags! “A purse is something you buy from Walmart” he’d say. “A handbag has quality.” I’ve called all my bags handbags and carried them the proper way since! So we’re curious! 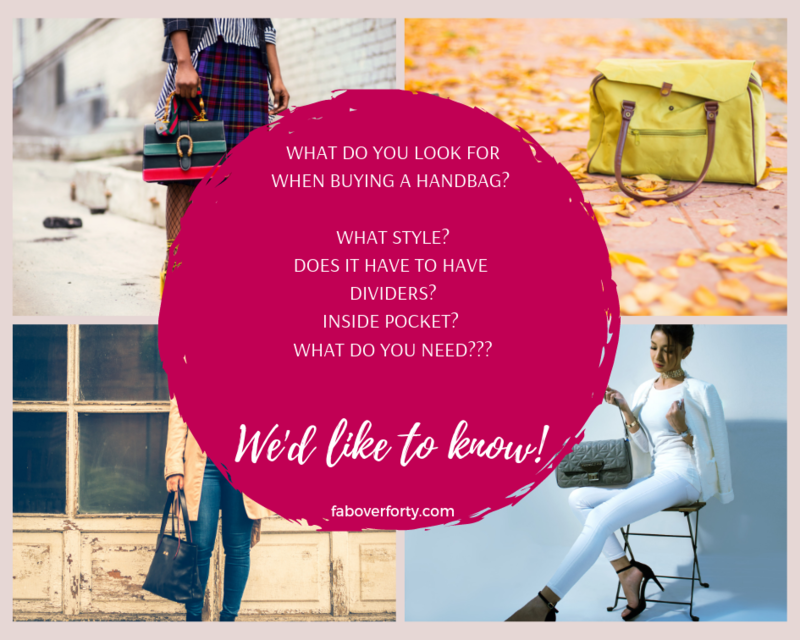 What do you look for in a handbag? Is there a perfect bag out there? What’s your favorite style handbag? Hobo? More structured like a Kelly style? What does the inside have to have – pouches or pockets? Zippers or dividers? Do you prefer leather, canvas or a different non-animal material? Is black your go-to color in a handbag or do you like more color, or even change with the seasons? How about function over fashion? We’d love to hear what you want in a handbag! If there’s a perfect handbag out there, I still haven’t found it. But a few modifications on the one I carry now and it would be close. I have carried a Clare V. black suede-ish messenger bag since the company was “Clare Vivier” (https://www.garmentory.com/sale/clare-vivier/women-crossbody/59178-clare-v-messenger-bag-black-nubuck#sm.000vvpjem1bwidd8s0l11ftv1h98f). I’ve tried vegan leather, but I’m always very aware that it’s a fake! I have a lot of other bags, but this one works so well for travel, evenings out, shopping trips…that I rarely use my colorful or smaller bags. I feel like it’s become a classic, so fashion AND function? I like black leather bags. It has to be functional but also l prefer a simple design with some strong detail.